Horsetracks Ice Cream - My Healthy Version of Moosetracks! Recipe updated 2/24/16. Pictures updated 7/13/14. I changed the name to “Horsetracks Ice Cream” 12.6.16, but the recipe was not changed. Moosetracks happens to be one of my favorite ice cream flavors, and I don’t think I’m alone in that. Chocolate and peanut butter are a natural pairing. The good news is that you can have a healthy version of your favorite treat! Don’t have an ice cream maker? No problem! 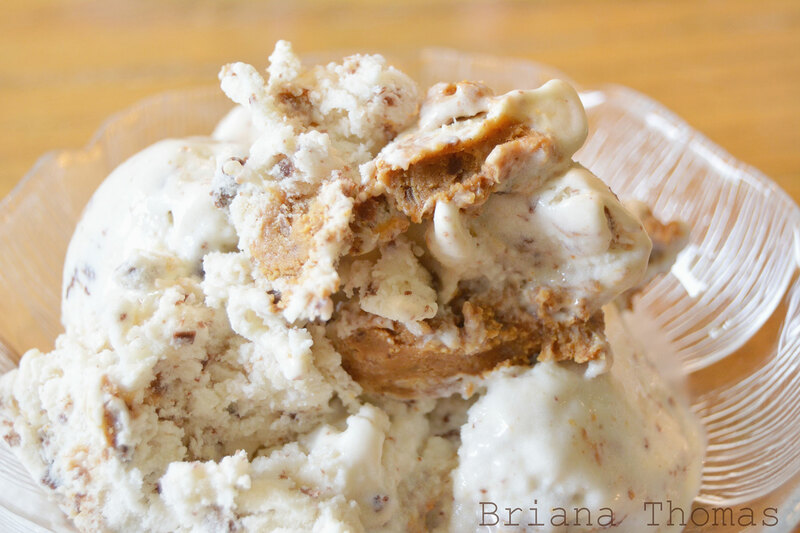 Here’s a single-serving Horsetracks Ice Cream recipe that you can make without a machine! 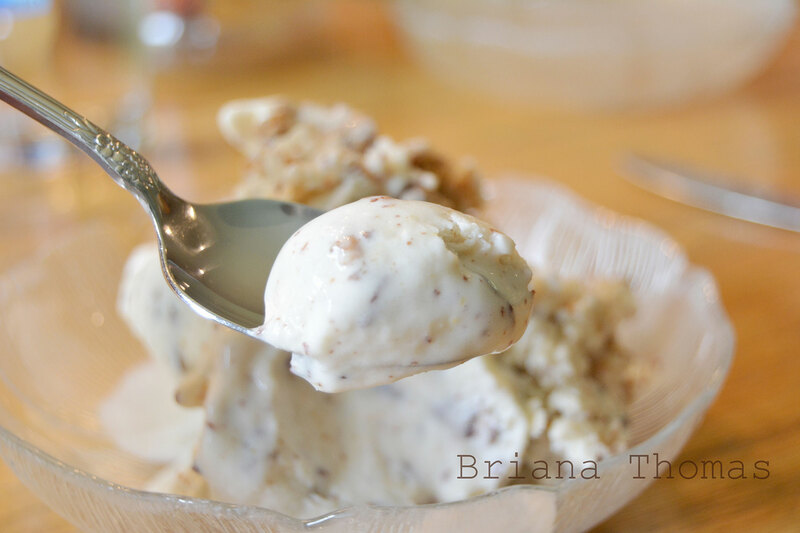 THM:S, Low-carb, Sugar free, Gluten free - my healthy version of Moosetracks Ice Cream! Blend all the ice cream ingredients together until completely smooth. Churn in an automatic countertop ice cream maker according to manufacturer's directions. Meanwhile, melt the coconut oil and cocoa powder together. Stir in the stevia and set the mixture aside. When the ice cream is done churning, transfer it to a freezer-safe container. Place a few dollops of peanut butter on top and drizzle the ice cream with the chocolate mixture. Put the ice cream in the freezer. After 5-10 minutes , use a spoon to swirl the peanut butter and chocolate into the ice cream. Return to the freezer to harden to desired consistency (or eat right away). Like most homemade ice creams, this recipe is best eaten fresh (unless using vegetable glycerin, which gives you more flexibility-see below). If you have leftovers, freeze them and when you're ready to eat them, either let them sit out on the counter for 30 minutes or so or defrost them for a few seconds in the microwave. I recommend adding 1 T of vegetable glycerin to this ice cream to keep it from sticking to the sides of the ice cream maker and to keep it softer and not let it get hard so fast in the freezer. If you freeze the ice cream for an extended length of time in the freezer, it will still freeze hard, but if you let it sit out to soften up a little, the glycerin keeps it scoopable instead of icy. Transfer the ice cream from the freezer to the refrigerator 3 hours before serving for optimum texture, or let it sit out on the counter for 30-40 minutes. *If you're concerned about salmonella poisoning, use a pasteurized egg. These can be purchased, or you can make them at home (Google it). If you don't have an ice cream maker, you could try freezing the mixture in ice cube trays, then blending the frozen cubes in a high-powered blender. You may have to add some almond milk or cream to get the mixture to blend. Stir in the peanut butter and chocolate swirl by hand after blending. I changed the name to "Horsetracks Ice Cream" 12.6.16, but the recipe was not changed. I recommend sweetening this ice cream with THM Pure Stevia Extract Powder, which can be purchased from the Trim Healthy Mama online store. I use a Cuisinart 1 1/2 qt. Automatic Ice Cream Maker for all my ice cream making. I’ve been happy with it so far. wished you made video so i could see the texture of your ice cream…. Hi! What purpose does the vegetable glycerine serve? And , can it be substituted with something else? Thanks! why can’t you make a video of this recipe? makes it soo easier visually…. 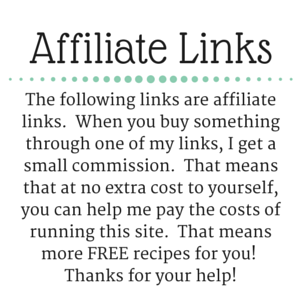 I blog for a hobby, not a career, in my spare time. 🙂 I would like to start making more videos, but haven’t gotten around to it yet (got married and moved, wrote a book, and sang with a choral ensemble in the last year). Hello! My husband just ordered me the ice cream maker for Valentine’s Day and this is going to be my first ice cream recipe I try! The question I have is can I use a different brand sweetener instead of the THM stevia extract? I don’t have that one yet and I don’t want to wait. I have truvia and Swerve…would one of those work? Is this an egg or egg yolk? Thank you for your reply! My mom and I made it tonight! Yum! Can olive oil or be used instead of coconut oil for the chocolate? No, I’m afraid that wouldn’t taste very good, plus it wouldn’t harden like coconut oil. I’m sorry! We have a handcrank ice cream maker. Actually, probably 2 of them, our families LOVE hand cranked ice cream!!! Can this recipe made in one rather than needing an electric maker or freezing into cubes? Sure! Most handcrank machines are bigger than 1 1/2 quarts, though, so you may want to multiply the batch. This is delicious!!! Thank you so much! I used half the glucommannan, I find the THM Glucci to be pretty effective in smaller doses. Hi Briana, I just had this over the weekend and it is AMAZING. I felt slightly guilty for how indulgent it was and I cannot believe that it is healthy! I’ve also been enjoying your cookbook and made the whoopee pies last night. Thank you for creating such amazing food! Keep up the fantastic work! Thank you. I’ll let you know! Can I substitute xanthum gum for the Glucomannan Powder? That should work. 🙂 You may need to use a little less than the 1 tsp. called for. I’ve found that xanthan gum is often a little stronger than glucomannan (maybe it depends what brand you have). I don’t use stevia…how much surgar would I use in place of stevia? What can I substitute for cottage cheese? I hate cottage cheese! Cream cheese maybe? I’m guessing you won’t taste it in the recipe. 🙂 If you have super sensitive taste buds, maybe you’d be better off looking around for a recipe that doesn’t include cottage cheese (there are lots of low carb ice cream recipes on Pinterest). Looking for a recipe that suits your needs might be easier than messing around with substitutions. How can I make this without the egg? We are allergic. Just replace it with a few tablespoons of cream. Briana, you are an ice cream genius. This is my favorite on-plan ice cream recipe. Yummmm!!!! Can I use Xanthum Gum in place of Glucomannan? I have had this pinned for a long time and finally got around to making it today. It’s WONDERFUL!! Thanks for such a great recipe! Hi Tanneal! I have suggested instructions for making this ice cream in a blender included in the Notes section of the recipe. 🙂 You will definitely get a better texture with an ice cream maker though. Briana, I love your blogsite. Your hot chocolate recipe has been my go to indulgence for the last couple of weeks. It’s so good. I just received an ice cream maker for my birthday. Hurray!! So I have two questions. Do you use non-fat cottage cheese? and for ice cream for my whole family, is it easy to quadruple the recipe for a 2 quart ice cream maker? Thanks! Congrats on the ice cream maker! I usually use low-fat cottage cheese, but you could use full fat if you like. I think quadrupling the recipe would be too much for a 2 quart ice cream maker. I have a 1 1/2 qt. and this recipe doesn’t quite fill it up (it probably makes about a quart). I would suggest maybe doubling the recipe to start with. I am soooo trying this. I cannot find any ofbthe on plan ice cream!! !